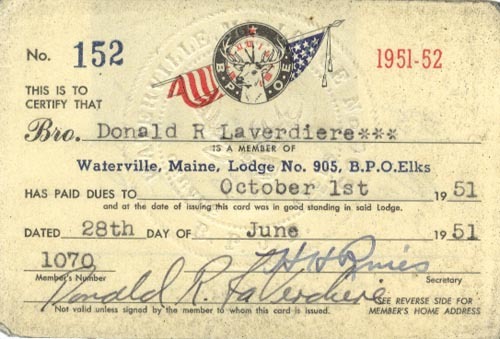 Donald R. LaVerdeire, Waterville, Maine, Lodge No. 905, B. P. O. Elks, dated June 28, 1951. On reverse: 55 Summer St., Waterville, Me. Are you looking for LAVERDIERE ancestors? If so, we suggest posting a query to our Community Message Board to get assistance from other researchers.